Jen is currently traveling in Asia, so we thought this "Oriental" inspired color-day would be appropriate. The underlying color to this theme is red, which can be as subtle or as bold as you want. 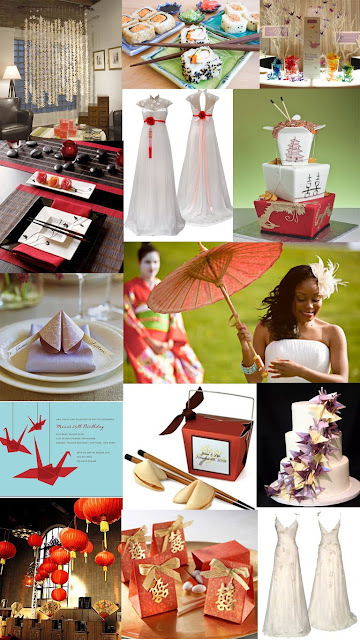 The key to this theme is the details: go for the take-out boxes, over-sized lanterns, paper cranes, chopsticks, and fortune cookies. We realize we're blending cultures, but you can pick and choose what look you want to go with. Just remember to be bold, and when in doubt, go for take-out!